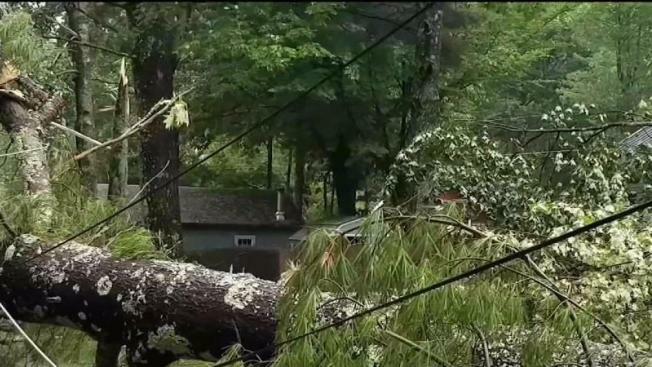 Intense storms left severe damage in New Hampshire. With the sky darkening, the wind picking up, and the rain starting, Don Johnson says he rushed to get his family into the basement of their New Hampshire home. "We saw, like, a wall of water. We couldn't even see the lake," the Gilmanton resident said. "The doors were flying open." The storm hit the community around Sawyer Lake Friday evening, leaving trees on top of houses. Downed power lines and toppled trees made driving in the area dangerous. "We couldn't even hear the trees come down, it was blowing so hard," Lou Thibault said. "A little bit of excitement I wasn't expecting to have." By dusk, clean-up and power crews were on the scene, starting to clear toppled trees. As they worked, residents waited, hoping to be able to return to their homes. As they did, they recounted a crazy evening in Gilmanton. "All of a sudden the windows just went black, and you just saw the branches flying, and I looked out and we had trees wrapped around our house," another resident said. "I was scared at the moment, and right now, I'm must relieved my brother wasn't hurt." Southwest of Gilmanton, lightning struck the Hopkinton Town Library, causing a 2-alarm fire.